Week 11 saw me travel to Hong Kong and Bangalore so I was never going to be able to do must running. I accepted that beforehand and I am not too disappointed with the very light week. The highlight was running in india for the first time, followed closely by running 35km on Sunday. I left Tokyo on Sunday morning and arrived in Hong Kong at 1:30pm. Although I got a little lost and wasted some time in Central Station, I made it to my room in Causeway Bay just after 3pm and I was out on the running track by 3:30pm. In the photo on the left you can just see the track sneak through the trees on the left of the park. The total length of the track is about 650m with many curves and bends. When I was in Hong Kong in July I tried to run that segment on Strava and totally missed it. I ended running outside the track and adding an extra 100m to the distance. 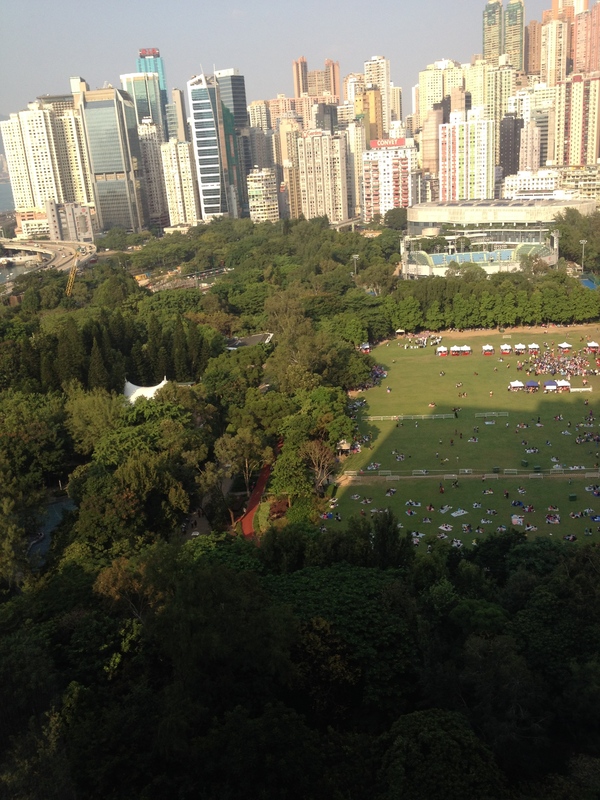 This time I successfully found it but because it was so crowded and a little hot, I could not run too long or too fast. I did manage to climb from 38th to 16th on the Strava league but as Philippe is sitting at 6th, I do not have much to boast about. Hopefully I will get back again some time and make a serious challenge for the title. On Sunday evening I met my friends from Namban Rengo Running Club, Mary, Gareth and Colin and Colin’s family and we took a ferry out to Llama Island to eat some seafood. Mary had booked a table at Andy’s seafood restaurant and we dined on shrimp, squid and lots more. It was a side to Hong Kong I did not know existed and it was a wonderful evening with the ferry journey to and from the island providing wonderful views of the sunset and the Hong Kong nighttime skyline. I was flying to Bangalore on Monday night and I did not get to run. 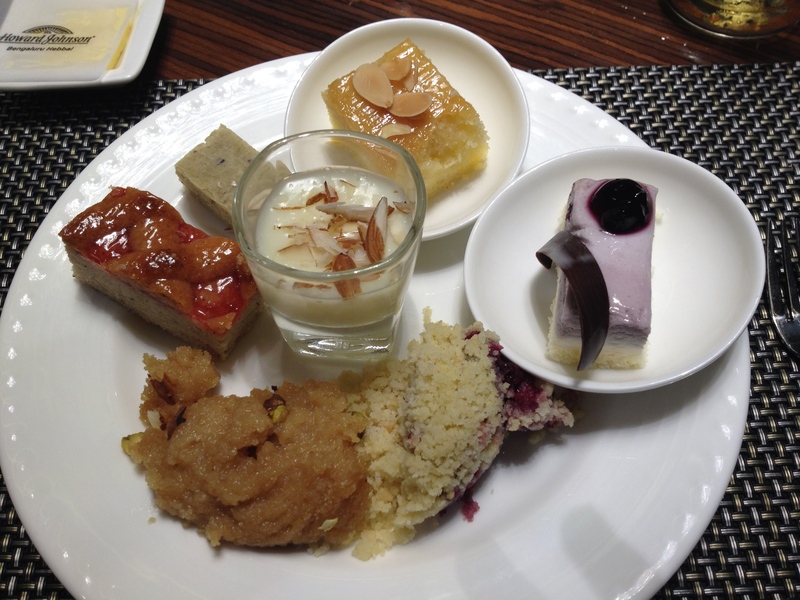 I arrived in Bangalore at around 1 am on Tuesday morning and made it to the hotel shortly after 2am. 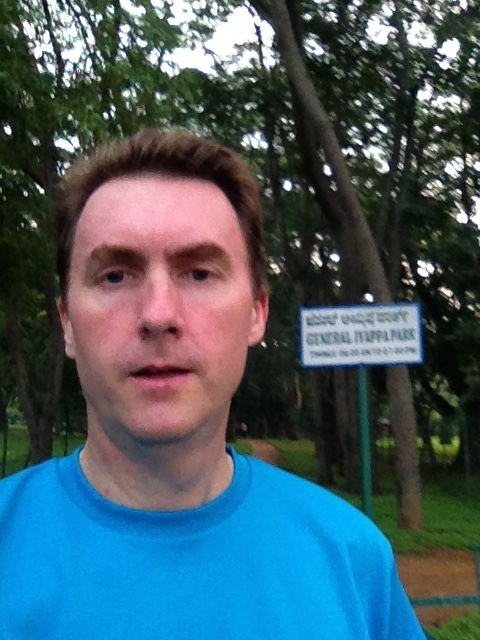 I was far too tired to run that day but on Wednesday morning I woke up at 5:30am for my first run in India. I had been to Bangalore before but the last time was in 2008 when I was not running regularly. This time I was determined to get out and at least do one run. My biggest concern was stray dogs. I have always been afraid of dogs and India has plenty of them running around. An Irish friend of mine who lived in India told me that he used to carry a stick with him and the sight of it was enough to keep the dogs away. I couldn’t find any in the hotel. I had asked my FaceBook friends to recommend a good running park in Bangalore and Padma came back with JP Park back which is just over 1km from the hotel. I was trying to go there and asked the porter at the hotel. He directed me to a closer park which although small, worked out well. I started running at 6:10. There was not a lot of people out walking but the roads had enough traffic to make me take care when I was crossing it. The park was the General Iyappa Park near the BEL circle. One loop is about 900m and I ran about 4 of them. I would have run more except that the dogs who were sleeping in the park were starting to wake up and wander around. Actually they all looked kind of lazy and didn’t bother be at all. One of them ran right by me and put the heart across me. I had been concentrating on the uneven ground so I did not see him coming towards me until he was about 10 meters away. I put on my best poker face and ran by without incident. Shortly after that I saw several more dogs cross the road and go into the park and I decided to head back. The following day on the way to the airport, the driver told me how dogs get into packs after 10pm and can attack people then. I was glad that I did not hear that on the first day drive from the airport. 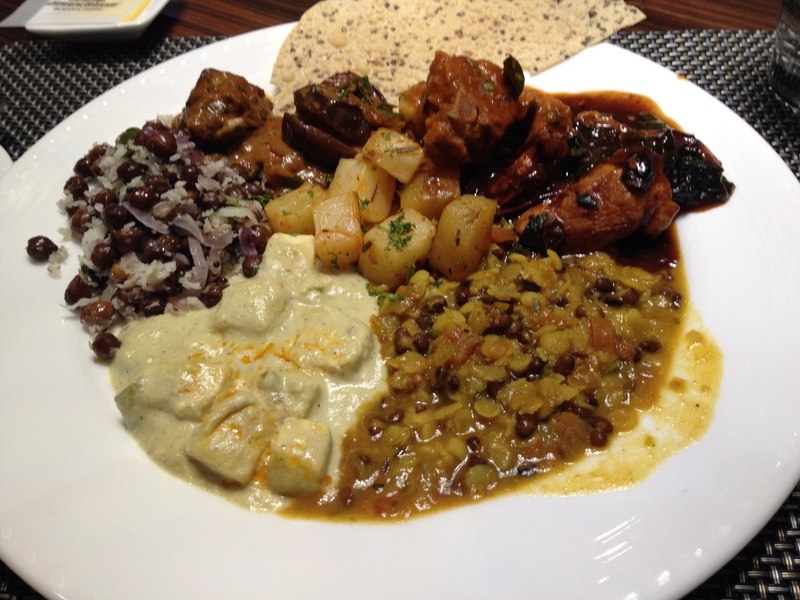 Of course, if you go to India you have to try the food and it is just too good. On Wednesday my colleagues took me out to a buffet and I thoroughly enjoyed a great feast, although it might have had something to do with the fact that I did not get up to run on Thursday morning. My flight back to Hong Kong was at 1:20 am on Friday. (Seriously, who makes these schedules?) I arrived at 9:30am but as my flight to Tokyo was at 16:30 I had 7 hours to myself. Fortunately, Hong Kong Airport has the best WiFi of any airport and I was able to get a bit of work done. However, I could not get any running done as I only got home at 11:30pm. On Saturday we were back in Yokohama for soccer and trail running. The autumn colours were lovely and I set out to do my regular 14km run. However after 4.5km I found that the trail was closed due to a landslide so I headed down the side of the trail and took a new route past Segami Pond. The new route was very nice, but it was very steep going downhill and the steps had to be carefully negotiated. At this stage I was feeling rather tired and heavy (too much good food) so I decided to just do an hour and call it quits. Sunday was going to be a busy day. I had 35km to run and no time to run it in one session so there was no choice but to break it up. I got up early and started the first session at 6:53. I planned to run 20km and then do 15km in the second session. However, I had not planned to run at goal pace but somehow it turned out that way. From the third km out I found myself running at 4:30 pace and I decided to go with it. I guess I was refreshed from not having run so much during the week and I finished the 20.3km in 1:32. I then had an hour to clean up, have breakfast before we headed down to Yokohama and part 2. As I was trying to run long I decided not to run the trail and headed out for the second session at 10:17. There was about 1hr 45 min between the sessions and although not ideal, was the best I could manage. The second session was, unsurprisingly, much harder than the first. My left hamstring was sore, but not injured, and my pace dropped down to 5:00 to 5:45. I ran along the roads for 7.5km and then turned around and ran back. The whole objective was just to get the mileage up to 35km for the morning and I managed that. 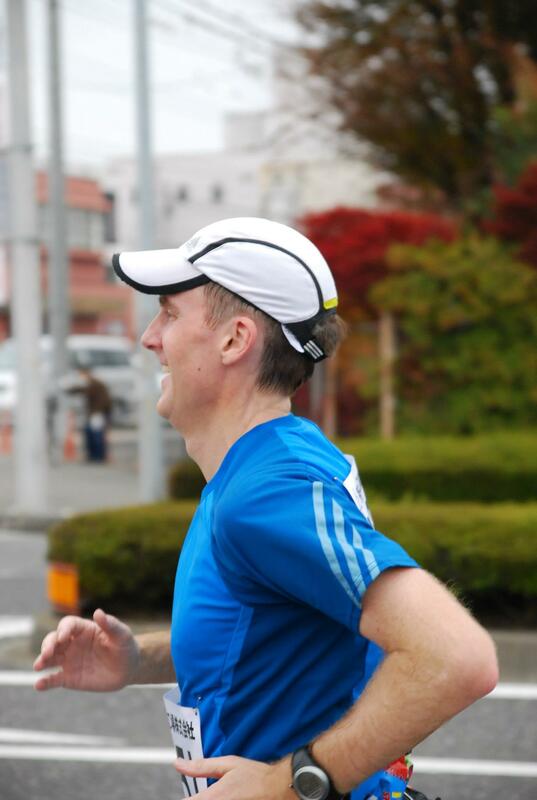 I ran a combined time of 2:50 for the 35km which is an average of 4:51/km, or a 3hr 25min marathon. Hopefully I can maintain the race pace on the day. Thanks James. I will and write more about the colour of the leaves next week. 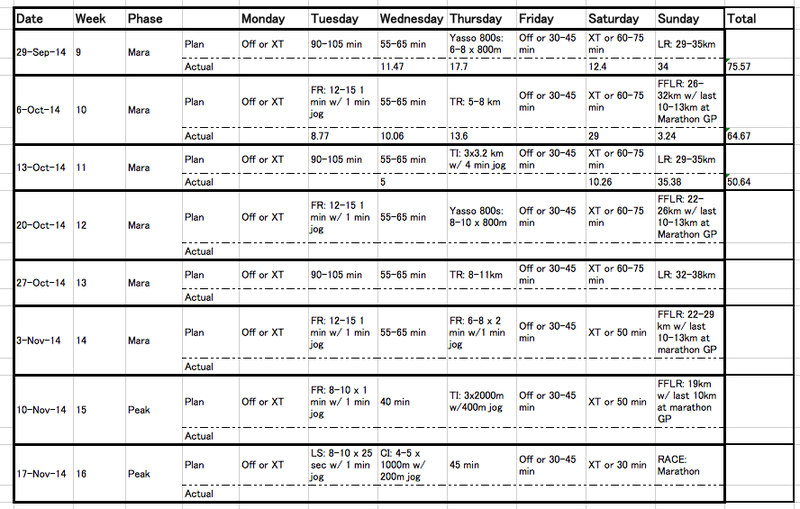 I have always been of the belief that training times are always far different from the ‘real thing’. Your training pace indicates that you are well on the way to a strong marathon. As for dogs I always reach down to ‘ pick up a rock’ and then get ready to chuck it at their heads….most dogs recognize the movement from being pelted by small boys all their lives, and retreat. Thanks Jon. I will keep that in mind.